The savvy use of paint, heirlooms and contemporary art will transform the drabbest nook into an eye-catching focal point. 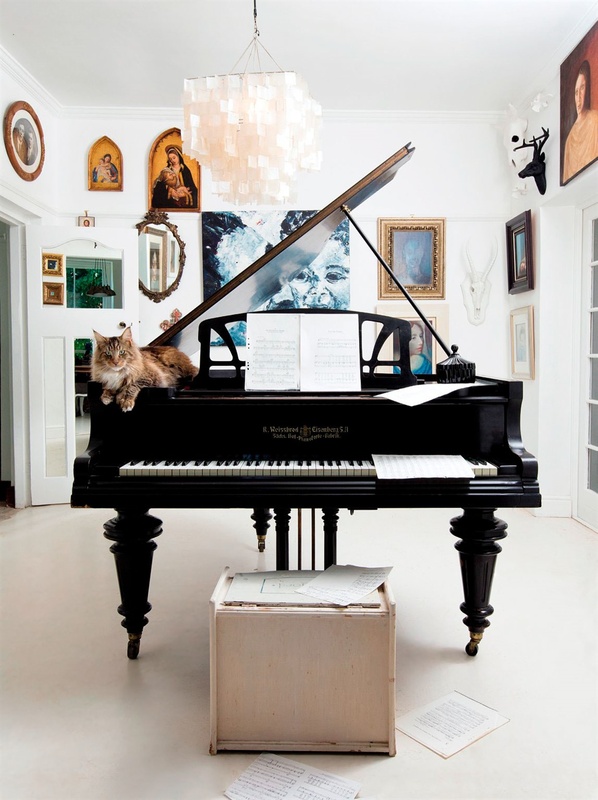 Aleit Swanepoel of The Aleit Group loves his piano room all in white – from the walls and ceiling to the cement screed floor. This eclectic room boasts a stylish combination of art, mirrors and mounted décor pieces – some of which have been positioned right next to the ceiling. Even Sir Bacchus the cat feels right at home! 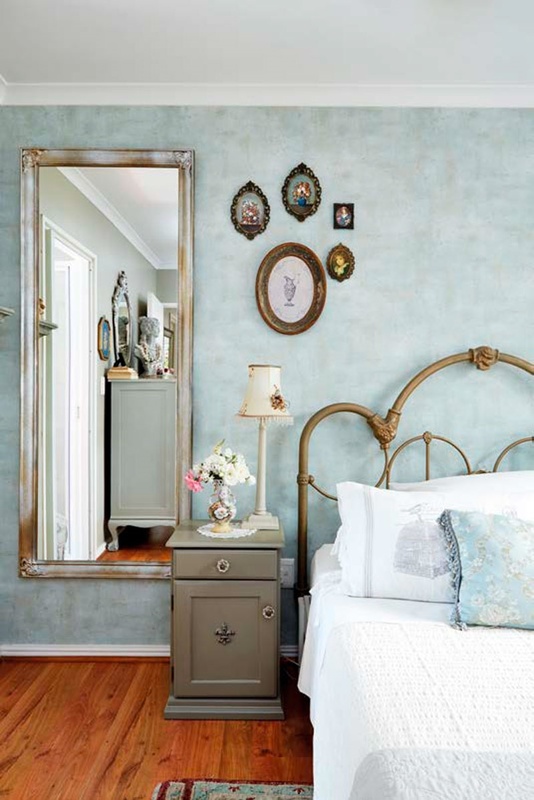 Amanda Craddock from the Cape Town suburb of Pinehurst created this romantic and elegant focal wall in her bedroom (left) with subtle wallpaper, a few interesting frames and a mirror that makes this small room appear much bigger. The different sizes and shapes of the frames add impact, and Amanda painted the headboard herself with Hammerite in the colour Old Gold to give it a metallic look that complements the frames beautifully. Chalkboard paint is an easy way to create a focal wall – and it’ll keep the kids entertained! Georg and Sanet de Villiers of Durbanville got Lemon & Lilac Paint Techniques and Home Decór to work magic in their children’s playroom (below left) back in 2006. Twelve years later, the cheerful stripes are as striking as ever, with art created by Mila and Stef strung up on cables. Now that they’re older, the room also serves as their study and homework room. The yellow bicycle was Sanet’s from her childhood days in the Eastern Cape. 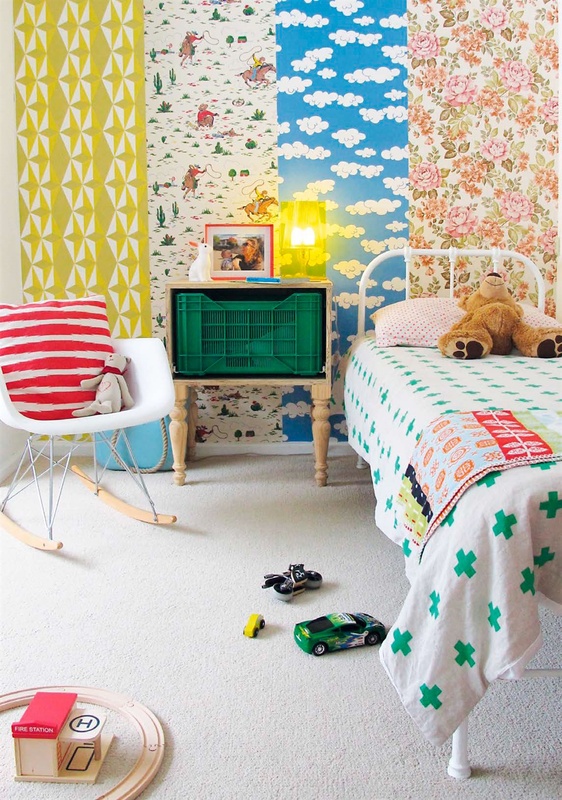 Another Home contributor, Jana-Marie Hey, came up with a brilliant idea – she used wallpaper offcuts and bargain rolls from sales to create a busy yet fun focal wall in her five-year-old son Benjamin’s room. 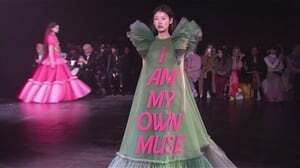 And he loves it! Jana bought the funky wallpaper on the left at a museum in Prague while the floral wallpaper cost just one euro at a shop in Amsterdam! The cloud wallpaper was also a bargain: R25 for a 10m roll at a small hardware store in Cape Town. 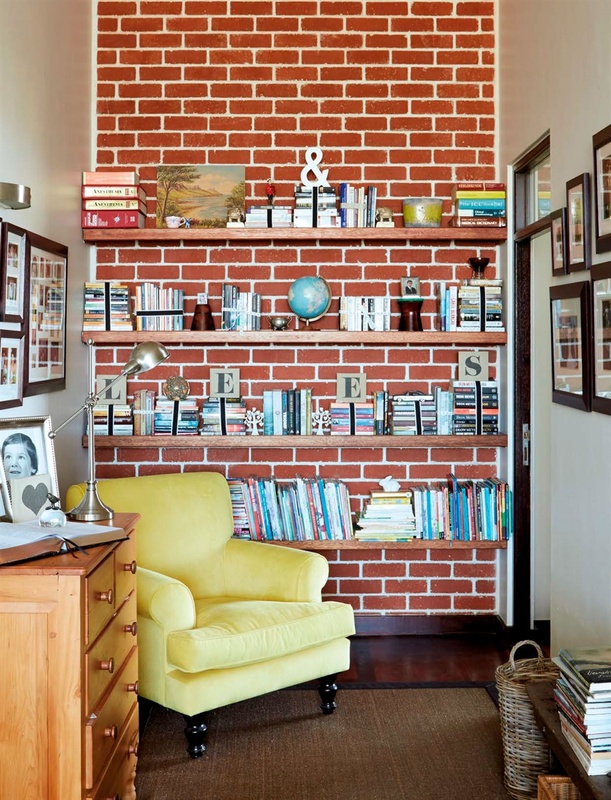 A facebrick wall, often regarded as an eyesore, is likely to be plastered over or hidden away, but Georg and Sanet added a bit of character to theirs with white grout that contrasts beautifully with the red bricks. 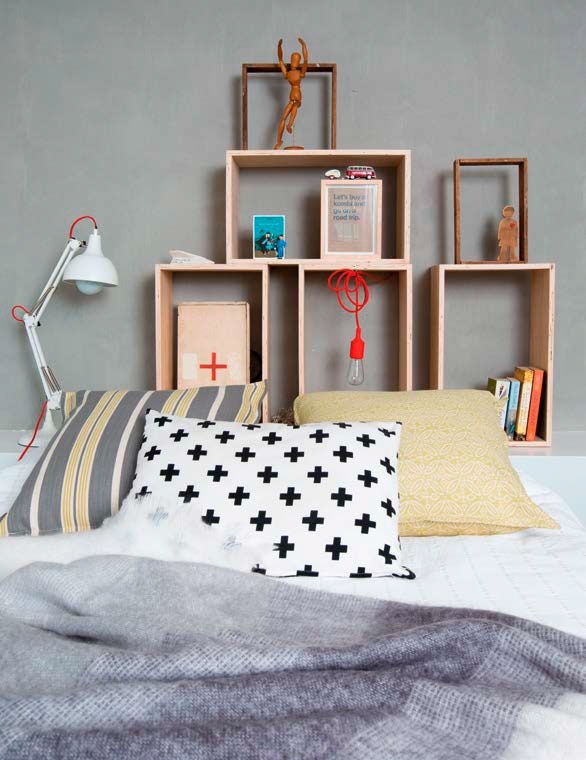 Floating shelves that provide storage space for books and ornaments have transformed the wall into an attractive focal point. Karin Cronjé of Hands on Creative Building & Management says both white grout or white cement can be used for this purpose. “Fill the gaps between the bricks carefully with a small pointing trowel, then wipe the bricks with a clean, damp sponge as soon as the grout or cement has dried – otherwise your red bricks will end up with white speckles,” she advises. 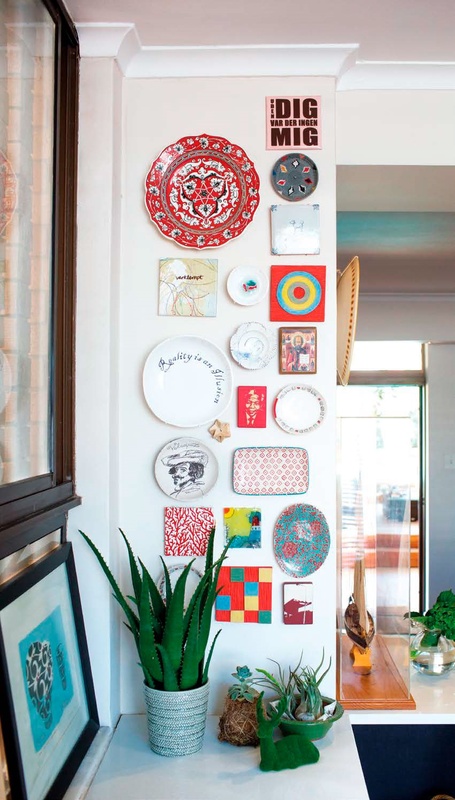 Karin and Barnie Louw of Cape Town love to collect ceramic plates and tiles as mementos from their travels overseas; here, pieces from Turkey, Denmark, Holland and Sweden are combined with local artworks by Theo Kleynhans and Alex Hamilton. 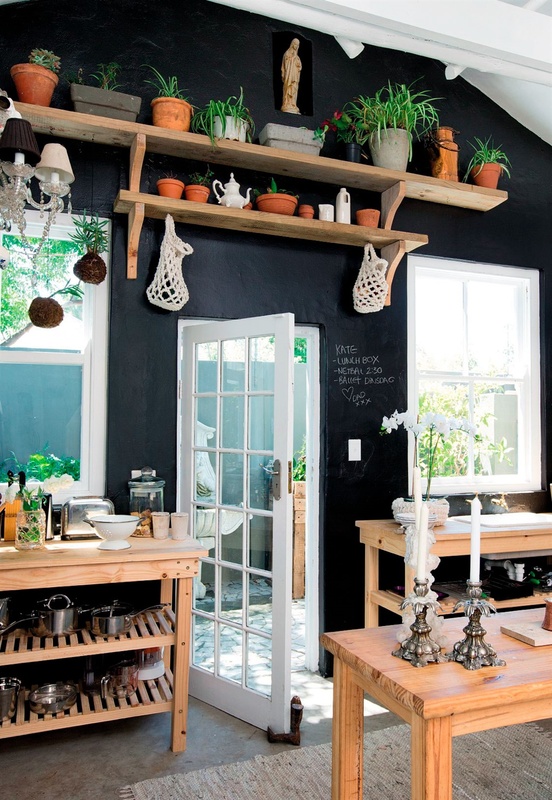 An eye-catching variety of items, colours and shapes packs a punch on this kitchen wall.